A few months ago Damir and I got into a massive fight about garlic mayonnaise. It’s funny how something so innocuous can be the catalyst for such an explosion of emotions. Months before this fight we were out to dinner somewhere and Damir asked for some garlic mayonnaise for his french fries; a European predilection he can’t leave behind, not that I blame him. 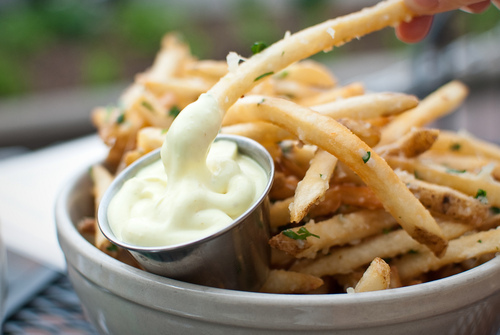 Garlic mayo and french fries are a magical combination and for anyone who solely relies on ketchup as their dipping sauce of choice, I strongly urge you to try this out. Anyway, he asked for it and the waiter went into the kitchen and the chef made it special just for Damir. He was delighted. Now he asks for it wherever he goes when getting fries with his meal. And this drives me crazy. The problem, my problem, is that often they won’t have it and the chef isn’t so nice as s/he was at the other place. And then Damir is sad. At least, that is my perception. I always cringe when he asks for it. Returning to the night in question, Damir asked for the garlic mayo and the waiter didn’t have it. Damir had been cranky all night and looked dejected when the waiter wouldn’t even ask the chef. For some reason, this caused me to either roll my eyes or make a noise that was the equivalent of rolling my eyes. As much as Damir’s requests for special waiter favors drives me crazy, my reaction to his request drove him twice as nuts. And then things spiraled quickly downhill. A very rocky unhappy slope. The argument didn’t last long, but it was definitely one of the few low points of our 5 year relationship. I mentioned this altercation to my mom the other night while having a general discussion about the difficulties of marriage. She asked me, “Why do you care?” Good question. I never thought about it. Why? Why should I care if he gets his first choice of sauces? It doesn’t effect my personal enjoyment of the meal. The best I could come up with is that I hate that he asks for special favors and also hate to see him disappointed. I feel as though it’s MY fault they don’t have the garlic mayo, especially if I picked the restaurant. I feel responsible for his disappointment. Which is totally stupid and irrational. So after this conversation with my mom the other night, Damir and I talked about it. What’s funny about it is that he admitted to feeling equally uncomfortable when I do things like as for a room or seat upgrade when we travel, which I do whenever possible. Or when I send a dish back that isn’t to my liking. But he decides just to sit back and let me do my thing and not worry about it. I need to follow that lead. How is asking for a special sauce any different than asking for a special seat? Mom was saying to me that one of the biggest challenges of marriage is understanding that the things that drive you crazy in your partner are a reflection in some way of your own issues. That you need to look at your gut reaction and examine it to see what is the true root cause of the negative response. I don’t know entirely what the answer is here, but I am certain it’s not about condiments. Houd het geheim. Hou het veilig.